Less than 15 years back, if a group of 200 engineering students were asked how many would like to become an entrepreneur, hardly 10 or 15 would raise their hands. How things spin around! Today, 80-90 per cent students opt to strike it out on their own instead of hankering for even a secure, high-paying job. There is also a growing trend of youngsters starting a venture while studying in college. There are also innumerable examples of young men and women in their 20s dropping out of college to pursue their entrepreneurial ambitions, thus dropping in on a tradition that stretches from Henry Ford to Mark Zuckerberg, by way of Bill Gates. “Most start their venture in college itself. For many, our education system does not make sense. For instance, studying computer engineering followed by an MBA in marketing, only to take up a banking job. Today, 90 per cent of IITians never take up technology careers,” says Mahesh Murthy, founder of Seedfund, which has mentored over 200 startups and invested in 50 companies in the last 15 years. Profiled here are an assorted group of ent­repreneurs. Nawaz Dhandala, 22, is someone who did not let one failure pull him down. 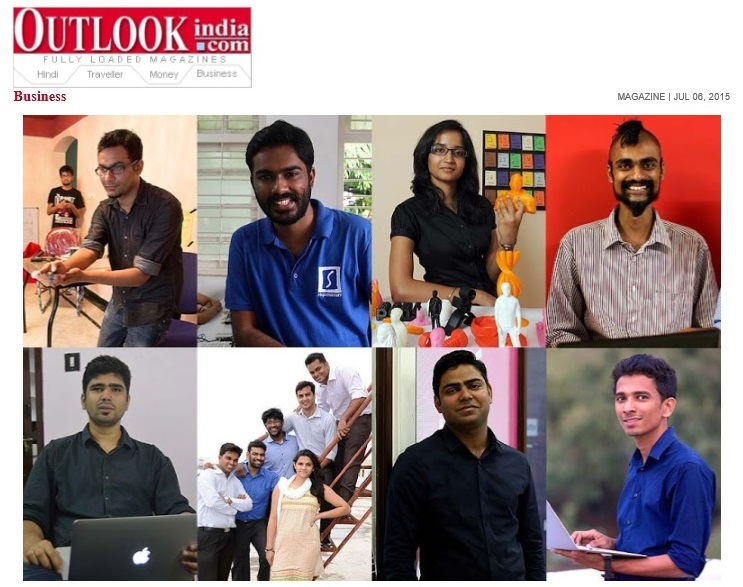 Rahul Yadav, Harshit Shrivastava, Deepak Ravindran are among a growing breed of youngsters who have dropped out of college to answer the call of business creation. And Manya Jha waited to meet the right partners to take the plunge while still in college. As all emphasised, it is team work, with everyone bringing varied talents to the table, that paves the way for success. India is in the midst of a boom in startups, reminiscent of the dotcom boom of the ’90s. Investors, consultants, and experts who mentor startups feel there is considerable improvement in the quality of new ventures, as also the market realities and business savviness of young entrepreneurs. “It is hard to tell if it is like the dotcom boom. Unlike last time, this time there is a real market, as a large number of mobile phone users are transacting on their devices. Last time, there were less than half a million internet users. Entrepreneurs are definitely a whole lot more savvy than the last time,” says Kanwal Rekhi, MD, Inventus Capital Partners. Like most investors, Rekhi lays emphasis on the tech component. “We do not like star­tups in India that are not technology-based. We fund both services- and products-based startups. Of late, we have seen many ‘software as a service’ offerings from Indian entrepreneurs for global customers,” he says. Data from the Union ministry of corporate aff­airs shows that last year one lakh new companies were registered in India, as against 19 lakh in China and six lakh in the UK. Of those one lakh, just about 3,500 were tech startups. Yet, with huge fund infusion, the spotlight is on some of them. Experts point out that in India a large number of firms never get registered or delay the process till business is stable. Many attempts fail not just due to lack of funds, which in most cases come from family and friends, but also lack of a good business plan or a mentor. “Our potential is huge but there is no record of who is mentoring them,” says Rajeev Banduni, co-founder, CEO and head of India operations of GrowthEnabler Global, a new seed fund investor which provides both mentoring and funding in India and the UK. There are roughly around 170 incubators like Microsoft, which takes a batch of 12 at a time. As such, just about 5,000 startups get the benefit of mentoring. The remaining 95 per cent depend on the internet, associates and seniors for ideas and guidance. Banduni says most startups are essentially based on fledgling ideas, without exploring its business potential, and so are more faith-based. “The average age of an entrepreneur is 22-32. They are generally first-generation startups. Some are starting straight from college. Some are tech people who get excited by a tech idea or go by an experience of a problem they feel nobody has a solution to, and so decide to offer it,” he points out. The result: Indian startups have a failure rate of 99 per cent, as against a success rate of 5-10 per cent in countries like the US. Yet in many ways Indian entrepreneurs stack up very well vis-a-vis those from other cou­n­tries. This is refl­ected by the inf­low of funds to startups, says Murthy, pointing out that as against an investment of $1 billion in 2013, there has been an inflow of $1 billion in just January-March 2015. Murthy attributes the investor interest to India’s high economic growth of 7.5 per cent in the last quarter of 2014-15. Besides being seen as a better investment destination in comparison to Europe, Africa or South America, the quality of some startups is also attracting attention of global investors and funds. “I think the quality (of Indian startups) has improved…. There used to be a big gap betw­een the quality of startups emerging from the US and Europe and those in India. But India is catching up,” says Mike Lebus, co-founder and director of Angel Inves­tm­ent Network, the world’s largest business angel network. “Foreign investors, especially VC funds, are interested in Indian startups at the moment, as they see it as a huge gro­wth market. However, I think the governm­ent should do more to make it easier for for­­eign angel investors to invest here,” he adds. Ajay Kela, CEO and president, Wadh­wani Foundation, which promotes student body clubs and aspiring entrepreneurs, feels that the government needs to do more to promote startups, given their job creation potential. “The government needs to create a fin­ancial policy and ecosystem that will help provide funds to startups. Ten years back and even today, there are thousands of things seeking solutions from bright minds. Not only are they providing ans­wers but also creating jobs,” says Kela. While opinion is divided among experts about how much engineering or higher education helps the startups unless it is into specialised products and services, there is una­n­imity on the role of mentors who will guide them. This is more so in case of first-generation entrepreneurs. As for failure, Kela points to the fact that even in the Silicon Valley just 5-10 per cent of the venture capital funded startups succeed. Among those which do are blockbusters like Google that hold the prospect of creating 3-4 lakh jobs. In India, the chances of success may be tougher, but many a young entrepreneur is proving that there is no dearth of ideas or the spirit of ent­erprise. The quest for creating an Indian Silicon Valley, bursting with ideas and bold action, persists.